Hampton Roads Bravo! is a bi-annual (February and August) regional cultural arts magazine, has been launched by Darden Publishing in partnership with the Cultural Alliance of Greater Hampton Roads. Each issue includes a Hampton Roads Art’s Venue Map with a 6 month Festivals and Events Calendar Schedule. Hampton Roads Bravo! 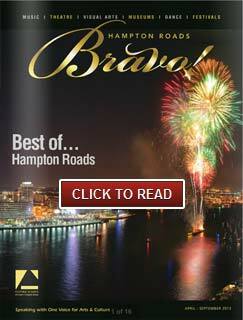 is the 2008 ALLI Award Media Winner for the promotion of Cultural Arts in Hampton Roads. ROI thru community support of the ARTS in partnership with the Cultural Alliance of Greater Hampton Roads. Retail locations, Art Venues, State of Virginia & Hampton Roads Visitor Welcome Centers, Airports, Hotels, Professional organizations such as Chambers of Commerce, tourism locations. Online virtual world digital visibility links. Feature articles on the value of Cultural Art community investments, art venue facilities, Art Venue location; event and festival calendar for the Hampton Roads Art venues, museums, city festivals, art galleries and much more. Passionate, discretionary income individuals and families, primarily 30 plus that enjoy keeping up with and visiting the area’s Cultural Art venues; readers seeking local entertainment opportunities and Cultural art education. Click Here for the Arts’ “Arts Build Communities” venue map.